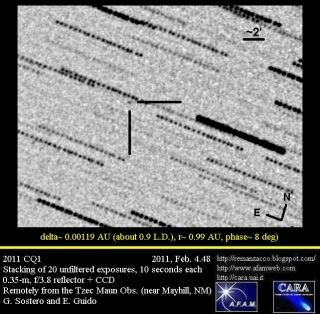 The newly discovered object, officially designated 2011 CQ1, is shown in this image from Tzec Maun Observatory in New Mexico. The following asteroids are expected to become brighter than magnitude 9 (on the reverse scale used by astronomers to measure brightness) and more than 90 degrees from the sun during 2011. Telescopes or binoculars are typically vital to spotting even the largest, brightest asteroids in deep space. This chart above details the major asteroid targets, as well as their expected brightness and the best moths in which to look for them. Consult a skywatching almanac for their anticipated locations in the night sky at specific dates.